Dramatic narrative enhance the musical highlight – mele (songs) and traditional oli (chants) performed in the kahiko (ancient) style. Powerful calls of the conch shells herald each month and 5 traditional Hawaiian percussion instruments and 2 wind instruments are nature’s many voices: pahu drum, kala`au (dancing sticks), `ili`ili (stone castanets), `uli`uli (rattling feather gourd), ipu heke (double gourd), `ohe hano ihu (bamboo nose flute) and pū, (conch shell). Their instrumentation masterfully conveys the changing seasons, the ancient Hawaiian gods, and their natural manifestations including: rain, storm, gusty wind – sacred representations of the deities and imbued with great mana. 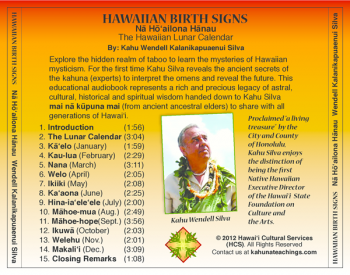 The listener embarks on a journey of discovery along with the ancient Hawaiian seafarers as they paddle in time to the steady cadence of the pahu in the canoe prayer chant, “Ia Wa`a Nui.” The author cleverly uses the double-hulled canoe to symbolize the dual nature of people born in Kau-lua (February). “Auhea la `Oe e na Kona,” a new composition for Nana (March) is accompanied by the kala`au and beckons kama`āina and malihini to behold the serene beauty of Kona, “wreathed in a garland of sea clouds like hinano blossoms.” Springtime blooms in Welo (April) with the sweet melody of the rare `ohe hano ihu instrument of romance and courtship in old Hawai`i. The harvesting and pounding of kalo (taro) into poi made the hard work easier as the men pounded to a rhythmic beat with the `ili`ili which replaces the traditional stone poi pounder. The mele ends with, “a delicious treat, indeed, the best. Ah! 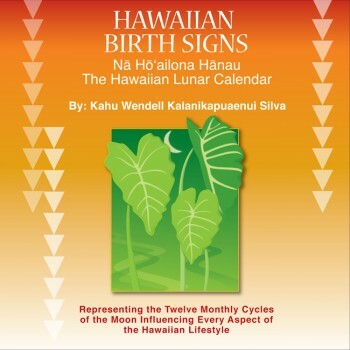 Satisfaction guaranteed.” A very special message to the people of Hawai`i is shared in Māhoe-hope (September) and a prayer chant in Makali`i (December) “Pele Honua Mea,” is offered to volcano goddess Pele in the spirit of aloha.